After Kim Dong-Hoon (Lee Jae-Ryong) and Seo Hye-Jin (Park Joo-Mi) marry and in order to allow Hye-Jin to accomplish her dream, Dong-Hoon sends Hye-Jin abroad to study. Dong-Hoon raises a daughter alone. "My Love, My Family" takes over KBS2's Saturday & Sunday 19:55 time slot previously occupied by "All About Marriage" and followed by "Ojak Brothers" on August 6, 2011. Afenie123456 May 26 2017 2:45 pm @Star Wars Lover: The husband didnt want to seperate because of the photos. He went home and cuddle is wife saying I trust you. Later he went to the museum to see is wife. He then saw her whit Seung-Woo watching each other lovingly that's when he wanted to break up. It wasnt a physical affair but to some it might be worse because it was an emotional one. She started to like him, open up to him also more than her husband. He found out she told him stuff he never knew. Of course he would feel bretrayed. Of course she started liking him, any relation that's new is always wonderfull, but a 10 year relationship can be hard whit time. The problem was the family not him. Seug Woo family would have been much worse, not accepting her (divorce + child + poor + crazy SW ex). So no it would not have been better if she left, it never crossed her mind anyway. The husband sold their house where they where living happily by themself so she could study in paris for 3 years....Anyway SW would have destroyed her life. Star Wars Lover May 11 2016 2:19 am Donghoon I thought acted like a fool when he got the photos of his wife and Seung Woo. He should have showed them to his wife and had her explain herself first. Instead he believes what he sees in the photos - which they weren't doing anything bad, like in bed together. He never even attempted to believe his wife or listen to what she had to say. He goes first to punch out Seung-Woo who had no idea why Donghoon was even there. And then, Seung-Woo kept putting his foot in it mentioning the photo and that people was misunderstanding about them. Poor Seung-Woo was in the dark and had no clue. Neither Seung-Woo or Hye Jin did anything wrong. In the meantime, Donghoon had no clue that Seung-Woo was leaving Korea and would not be around the gallery any more. It was all due to the selfishness of the girl that Seung-Woo was supposed to marry. arizona girl Apr 26 2016 12:56 am I had to agree with Hye Jin when she was separated from her husband and she said "all he does is laugh at everything." I think Hye Jin and Seung Woo would have made a better couple. Young-Hee's 3 boys were so cute. Lee Pil-Mo was great in this show. He is such a good actor. Yoon Mi-Ra is very pretty and a classy lady. I like her in all the shows she does. seoulbaby May 20 2015 11:00 am At first I thought I wouldn't be able to finish this because of the amount of episodes. I watched it exclusively for Lee Pil Mo, and I was not disappointed. Kim Ujin is my favorite character he's ever played. Not only that, but I loved this whole drama. It is by far my favorite weekend drama of all time. love love love... Aug 01 2014 4:18 pm I started watching this drama for Lee Sang Woo. I was disappointed that his part was so small. I only finished it because I just wanted to see how things ended, although it was no mystery since it was very predictable. I didn't like that they portrayed the women that worked outside the home as selfish bad mothers. If this is even a fraction of how daughters in law in SK are treated its no wonder they have such a low birth rate. If you marry someone's precious son forget about having any goals, dreams, time, or life of your own, stay at home and be treated like a maid. my love Nov 09 2012 10:11 am I've been browsing online more than 3 hours these days, yet I by no means discovered any interesting article like yours. It is pretty worth enough for me. Personally, if all website owners and bloggers made excellent content as you did, the internet will likely be a lot more useful than ever before. duong Aug 15 2012 8:46 am what`s the name of the violin music piece in this film? I am really attracted by this film ,especially its music.Thank you ! Jhill Jul 07 2012 12:52 pm What is the title of the song with SARARANDA words? One of the episodes has Kim Woo Jin teaching the right tune. The Wikipedia is missing the theme songs or songs featured in this drama. I saw Beige, I Believe in Love and Ost but not the Sararanda something....Do anyone know? 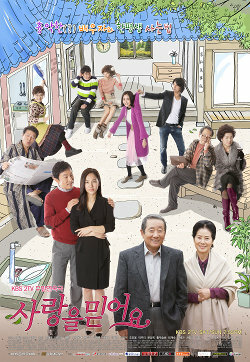 Michelle Feb 10 2012 1:47 am I missed the last episodes of this drama, there are no specific timings for any of them. Is there a way to watch the final episodes online.. I love KBS world!! Akeiko Kadiki Sep 20 2011 6:14 am I enjoyed watiching this Drama, but it's a bit of cliche. Roger B. Sep 11 2011 10:40 pm I started to watch this show 3 months ago while switching channels. I don't speak Korean but I like the story and actors. I just watched the last episode and I'm sad to see it go. Bravo to KBS for airing a very nice show. I stated to watch it every Sat. and Sunday night at 8 P.M. Pacific time. Sad to see it end. Eman Ahmed Sep 04 2011 3:21 am I'm am from Ethiopia. Ever since i started watching KBS WORLD i couldn't bother looking any other channels. Its the best entertainer. I saw My love My family the full eposide nd its a great movie it made laugh nd cry at the same time. I realy loved it!!!! JRS Sep 03 2011 8:02 pm What happened???? Last Saturday I tuned in to see Ujin bring Junhui to his mothers house and there was no show on - a blank screen! Now this week it's not on again! DId I miss the last episode? I'm heartbroken - like everyone else this was my favorite! Time Warner cable is the worst! Beret Aug 27 2011 7:59 pm My draw back on this drama is the way they treat others. A person becomes an orphan when tragedy struck untentionally, not by choice, okay there are those parents who blantantly abandoned children, so why must you hold that against a person who has lived, educated her/him self and lived an exemplary life, calling them orphan! Plus the home/marriage they are entering into is as fake as a piece of gold charm, this has always astounded me. You are not treated like a family member but a slave to your insipid inlaws, who would not lift a finger to help you that is so cruel. This drama show the crack in the family dyanamic, a mother marry he precious daughter off , then has to be treated that way, herein lies my bewilderment. beklot of jeddha Aug 12 2011 2:59 am My Love, My Family chungmal is family oriented program, I never miss a single episode sincha yu ! saranga me da! beklot of jeddha Aug 12 2011 2:50 am Iam from the philippines currently working in suadi arabia for seven years,when I accidendly found KBS WORLD in my sattelite channel seven years ago, I always watch korean program espicially korean drama, It helps me to release my stress, May be I wont stay here in saudi arabia w/o KBS WORLD, KEEP UP THE GOOD WORK !!! Jose Aug 05 2011 10:27 pm Eventhought I'm not Korean ( I'm Peruvian ) I enjoyed watching the drama played at 8:25 pm during the week and also the one played Saturday and Sunday . Jose Aug 05 2011 10:23 pm Even thought I'm not Korean ( I'm peruvian ) , I like and enjoyed the drama played at 8:25 pm during the week and the one played Saturday and Sunday . Nanette Aug 04 2011 3:28 am it's a very inspiring drama that makes you laugh and cry..I would like to know the song played in that drama regardless of Believe in love..
Atara Jul 28 2011 10:29 pm I love this drama although I am not Korean. Joyce Jul 24 2011 10:07 pm What was that song that Woojin was singing? "I'll pray for you"
miss aja Jul 08 2011 12:36 am love the story. Atikah May 09 2011 7:02 am I love this movie. Is Phil Young and his friends really band in Korea until now? ruta Apr 14 2011 1:01 am i love korean dramas transfered on KBS world i always watching this drama specially moon jung hee she's so so so funny , Na moon-hee (the grandmother) when she mad and Hwang woo seul hye & Lee pil mo when they fighting i enjoyed it . Lee sang woo his cool guy i love him & i love all the actors they are so funny and grate. Mark Apr 10 2011 5:59 pm I'm a fan of Korean dramas. I suppose its a good thing considering my wife is Korean. This drama is okay but then I'm not a fan of family dramas. I do love the historical ones though. What I do like about this drama is Park Joo Mee. Absolutely beautiful. And this comes from someone who doesn't particularly find Korean women all that attractive. (Yes, yes, I know I said I'm married to a Hanguk saram but I consider her beautiful too). I also enjoy the antics of Moon Jung-Hee and her goof ball husband. hiwote molla Mar 06 2011 9:50 am I love watching this film and i am watching it on friday and saturday on kbs.This family have all kinds of problems that you can find on a normal family.I cannot wait to see the next episode on friday.Most of all i love the fight between choi yoon-hee and kim woo-jin. mary m. michael Feb 11 2011 9:16 pm nice beginning..with a twist here and there in each character, i just can't wait to watch the very next episodes! double thumbs up!! annie Jan 24 2011 6:46 am i enjoyed watching this drama on kbs world in malaysia last sat & sun. what a very natural & warm family...although its not a perfect family but i cannot wait until this next coming sat & sun to watch this drama. congrats!